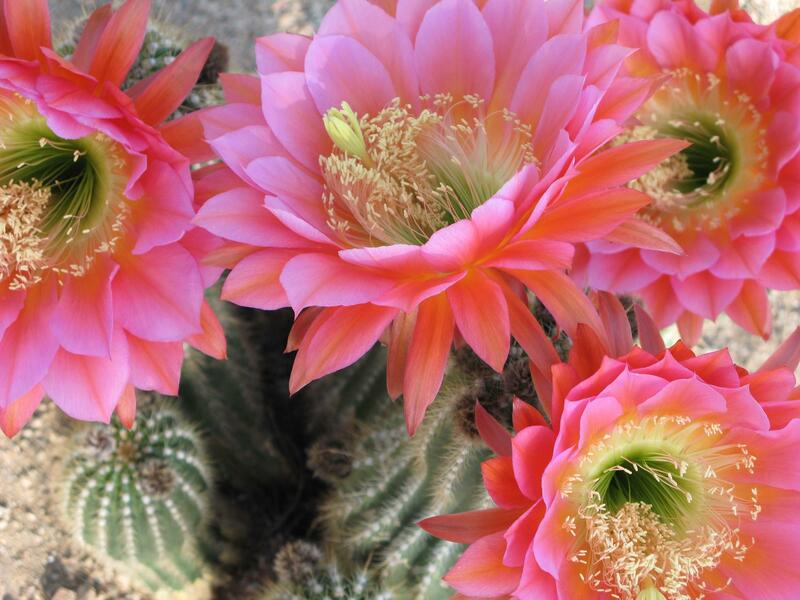 The crown jewel of Carefree, and an amazing oasis in the desert, the Carefree Desert Gardens is only one of two public botanical gardens in the Valley located along the pedestrian friendly, Easy Street in downtown, Carefree, AZ. The Gardens are open 365 days a year. 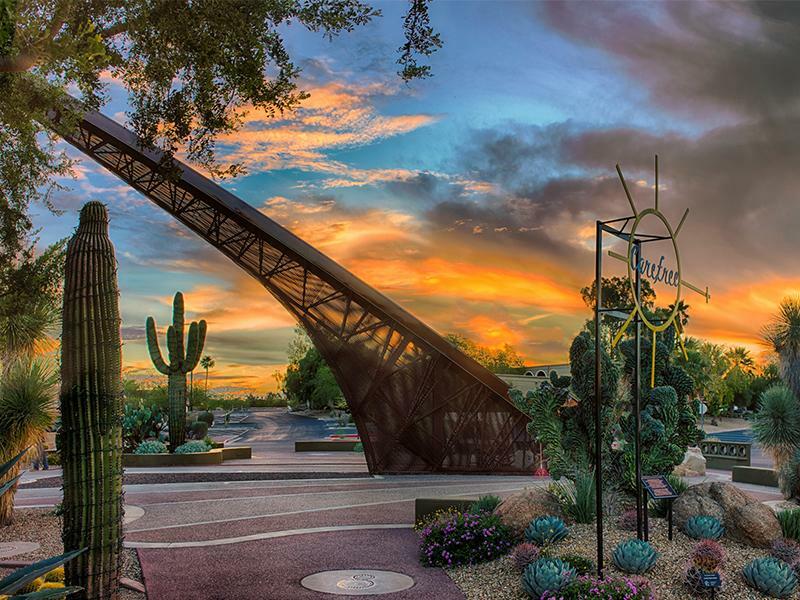 The Carefree Sundial landmark sits in downtown Carefree along Easy Street within the Carefree Desert Gardens. Completed in 1959, it is one of the largest sundials in the United States and was designed by architect Joe Wong and solar engineer John Yellott. The Carefree Sundial stands 35 feet tall, extends 72 feet and is 90 feet in diameter and points to the north star. Located in Sundial Circle Plaza in downtown Carefree, Arizona, this huge dial is made of steel and plated with anodized copper and the metal gnomon, the shadow-casting portion of the dial rises 35 feet above the plaza. On a clear sunny day, the Carefree Sundial is a majestic structure to photograph against the gorgeous backdrop of the Sonoran Desert. THANK YOU to the local Carefree Kiwanis for donating the funds to build this beautiful new addition to the east side of the Carefree Desert Gardens! It has been a hit with families in the surrounding Desert Foothills area. 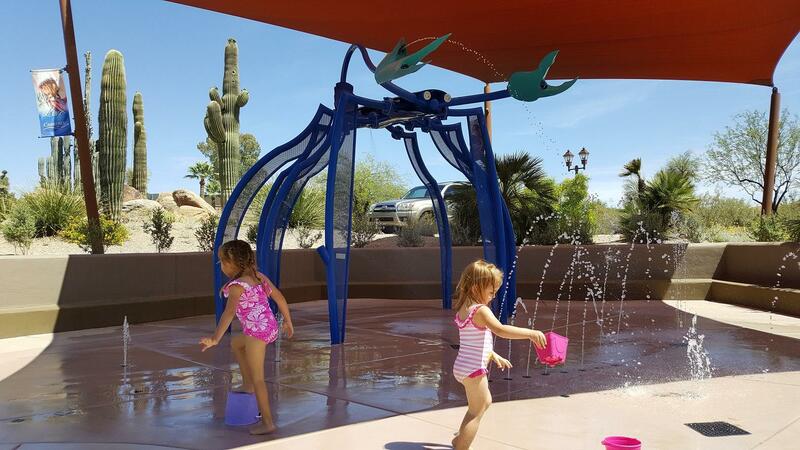 In keeping with the Carefree Desert Garden theme, there is a Scorpion centered within the splash pad named“KIWANI” who is an exciting one-of-a-kind addition! The Scorpion comes to life when guests least expect it, creating an all new level of interactivity and team play experience. It is an exciting focal point for Carefree’s water park, and combined with the other ground spray jets, create a magical, nature-inspired play environment.